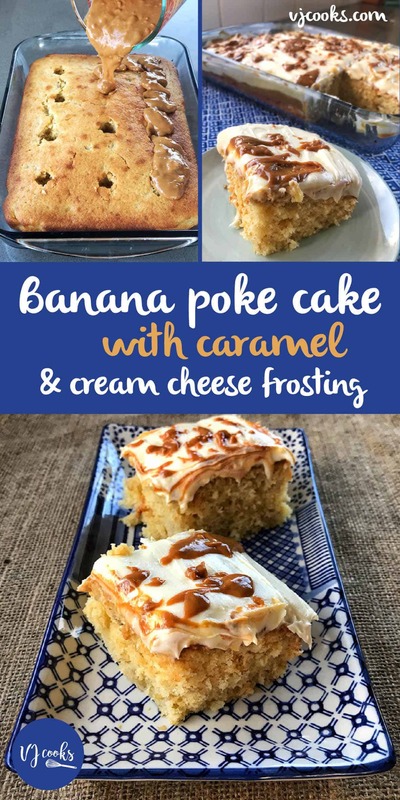 This delicious banana caramel cake with cream cheese icing is based on the American Poke cakes, which is when you poke holes into the baked cake and spread over the filling before topping with icing. 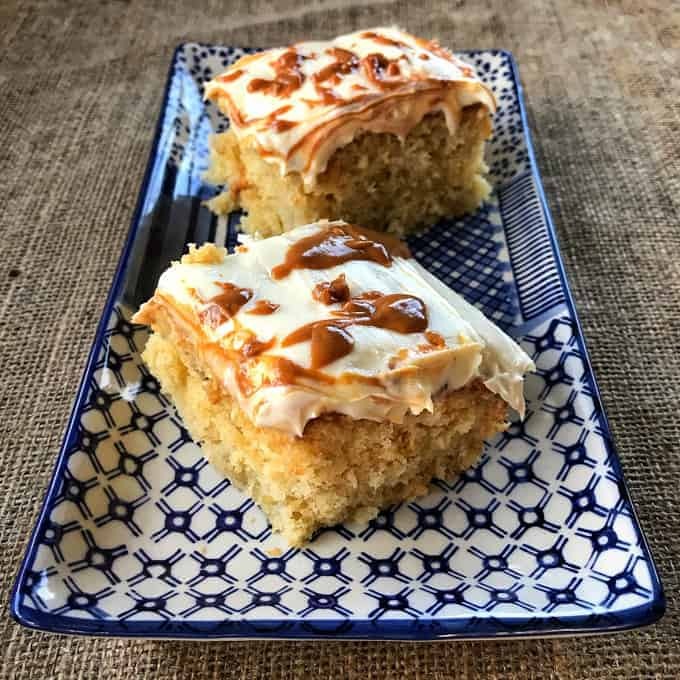 After seeing my bananas going brown I wanted to create a new recipe and I have always be fascinated by the poke cakes I see on the American foodie websites, this recipe for banana caramel cake feeds a crowd and would work well as a dessert at a dinner party. 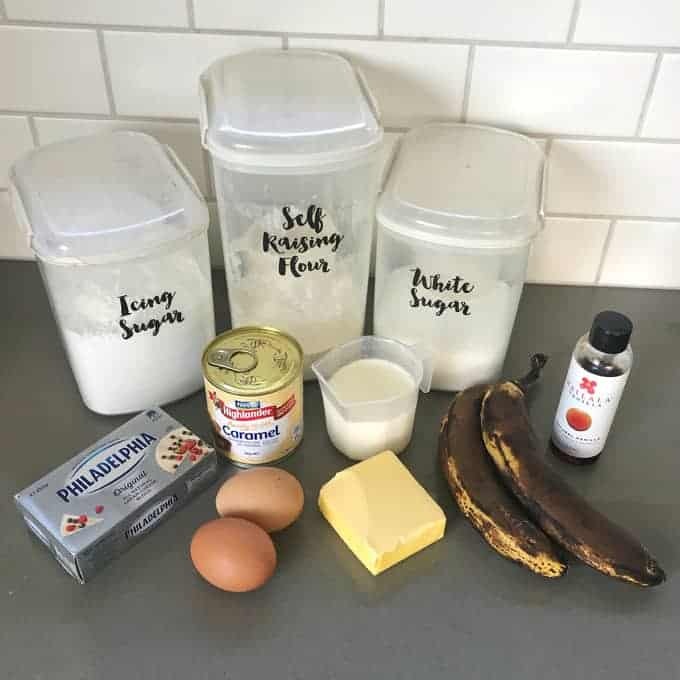 The cake is so easy to make you just fold all of the ingredients together to produce a light fluffy cake with delicious banana flavour. 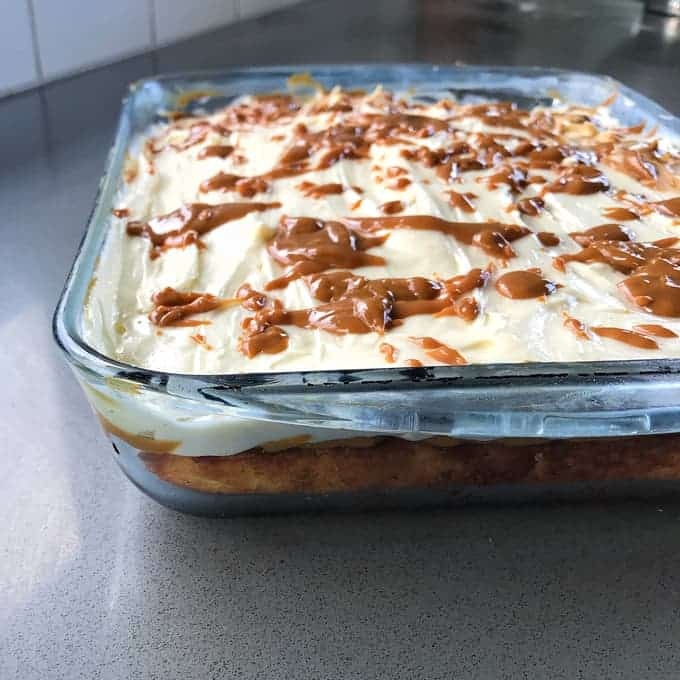 By using the canned caramel it takes out the step of making it from scratch, just heat it up in a jug then pour it over the banana cake. The icing is like an American style cream cheese buttercream frosting and it really makes this cake extra special. It is a cake for people with a sweet tooth so you could always leave out the caramel layer if you want to tone down the sweetness a bit. Your guests will love the surprise when they cut into the cake and the extra caramel is revealed under the amazing cream cheese frosting. That’s why I decided to call it Banana Caramel surprise cake. To finish it off for presentation I drizzled over the rest of the caramel for a rustic look, if you want it to look cleaner just leave off that step. If you want some more baking ideas check out my recipe for Date loaf or other sweet treats on VJcooks.com. Mix together butter, sugar, vanilla and eggs in a large bowl. Add banana and milk then stir again. Sift in flour and fold all ingredients together until combined. 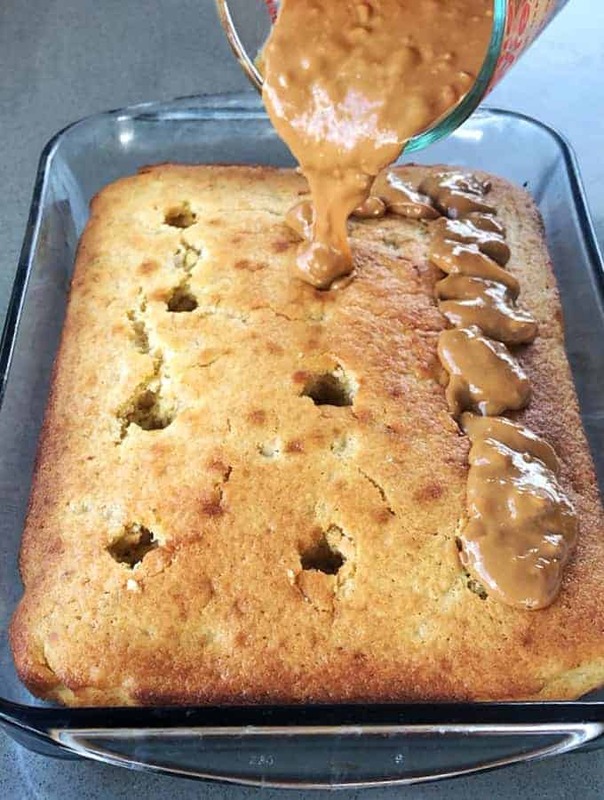 Once cake has cooled poke holes into the top, melt the caramel in the microwave for about a minute then pour over the cake. Spread the caramel to the edges. 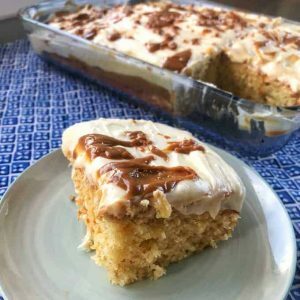 Reserve about 2 tablespoons of caramel to drizzle over the cake at the end. 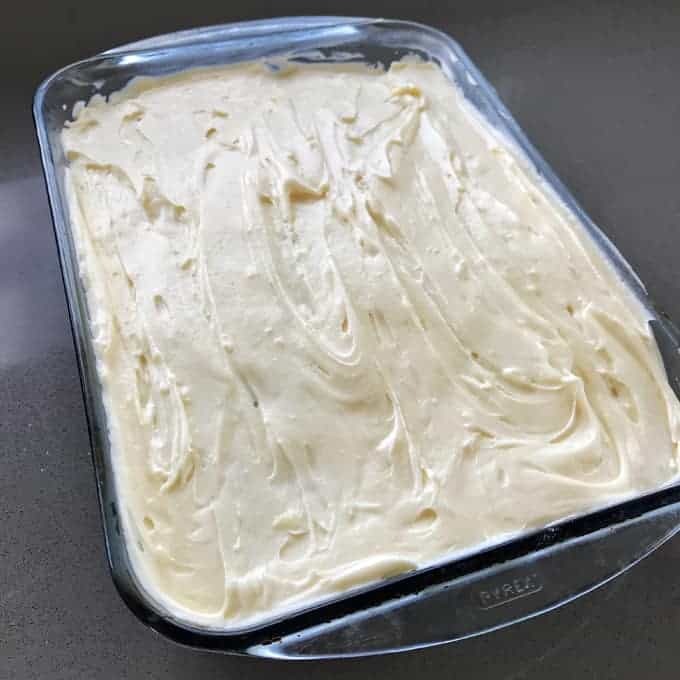 To make the icing make sure the cream cheese and butter is at room temperature and softened. Use a mixer or electric beater to beat together cream cheese, butter and vanilla. Once mixed scrape down the sides and add icing sugar then beat again until the icing is soft and fluffy. 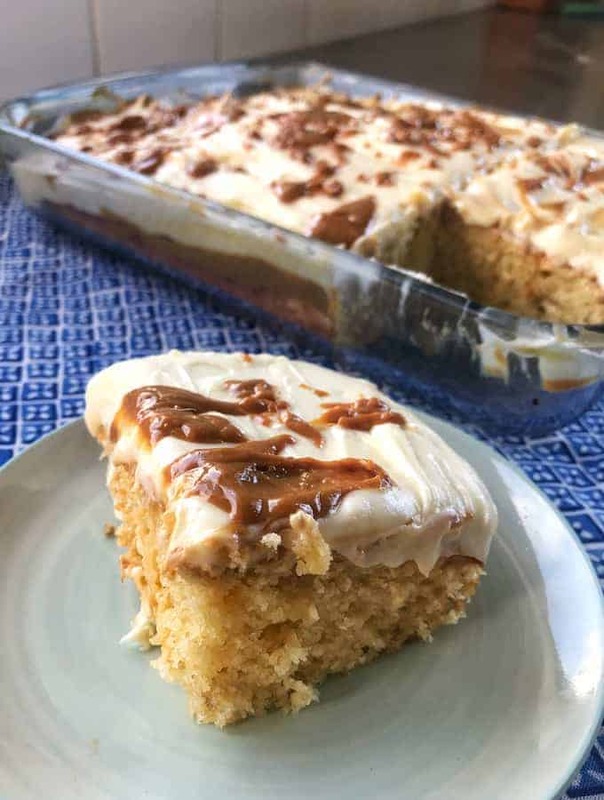 Spread the icing over the cake and drizzle over the remaining caramel. 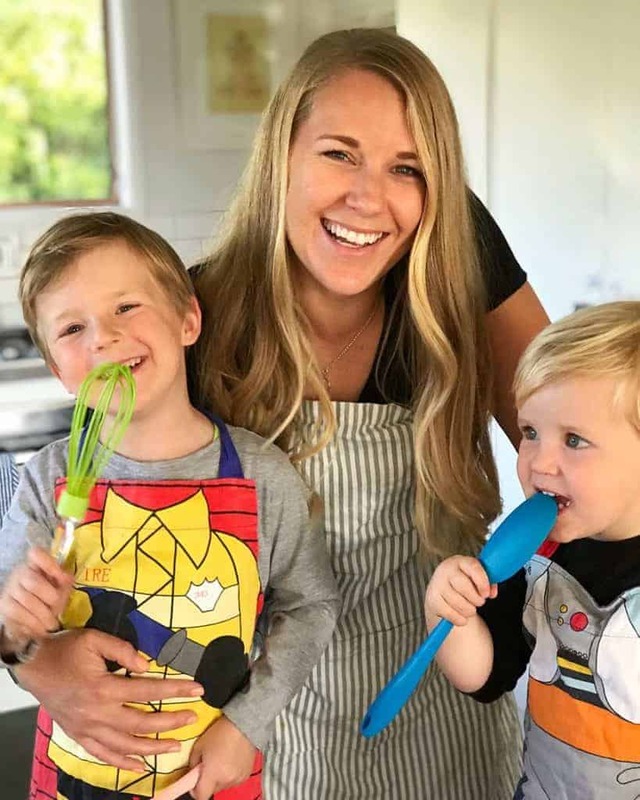 Cut the cake into slices then serve.